ACCS supports multiple languages but for this post, I’ll focus on Node.js. 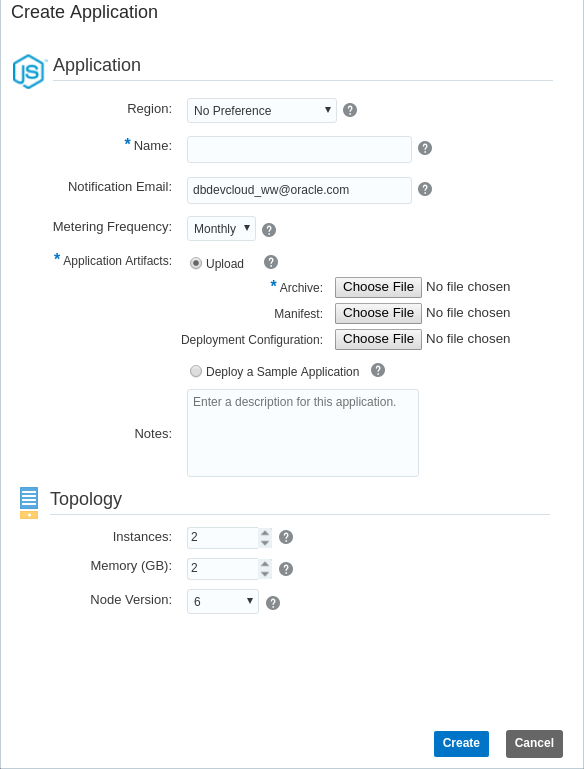 The following instructions show how to deploy the Node.js version of DinoDate to an Oracle ACCS instance. Install the NodeJS modules. ACCS assumes your deploy package will include all necessary modules. Copy the nodejs application into the deploy directory. Change to the deploy/nodejs directory. Test the application to make sure everything is working. Open the search tab and execute a search. I typically search for ‘eat’ it will return several members. Ctrl-c to stop the node server then switch back to the deploy directory. This file declares that we will use Node.js version 8 and provides the command that will be used to start the application. This file includes the environment variables DinoDate needs and sets the ACCS deployment to use 1G of memory and only install 1 instance. zip -rq DinoDateNodeACCS.zip commonClient/ nodejs/ -x "nodejs/node_modules/oracledb/*"
The Node.js platform in ACCS has the oracledb module pre-installed. If we were to upload the module we just installed it would cause a conflict that would cause the deployment to fail and be removed, so we exclude it from the deployment .zip file. Push the Node button to open the application definition panel. Click ‘Choose File’ for Archive and select the DinoDateNodeACCS.zip file. It’s also possible to include the manifest.json file in the DinoDateNodeACCS.zip file instead of uploading it separately. Build your application and test it. Reminder: do not include the oracledb module. Create a manifest.json file that contains at least the required Node.js version and the command used to start your application. You’ve downloaded DinoDate, the premier dating website for dinosaurs. Now lets get it up and running! Check Logger’s create_user.sql file. If you see an exit statement at the very end , remove it. 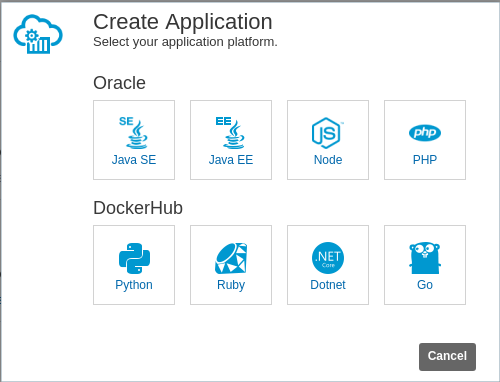 Install Oracle Instant Client with the sdk modules. IMPORTANT – Please make sure you’re using a database instance in which you can safely create schemas named DD, DD_NON_EBR and DD_LOGGER. Run dd_master_install.sql from an account connected “as sysdba”. Second prompt is what you want to name the schema that holds the Logger database objects. Third and fourth prompts are for your Tablespace and Temporary Tablespace. Currently there are RESTful APIs written in both NodeJS and Python. You can choose to run one or both. DinoDate uses environment variables for database connection and port settings. Create the following environment variables using the correct values for your system. DinoDate (NodeJS) will be listening on the dd_node_port port you defined above. DinoDate (Python) will be listening on the dd_python_port port you defined above. You can run both versions at the same time, provided you specified different ports. This will allow you to switch between languages by changing the ports and view the code examples specifically for each language. Please leave a comment if you run into trouble. Update: Thanks to Chris Jones for letting me know there has been an update to node-oracledb that handles the original problem. I had originally written this post in November 2015, back then everything ‘didn’t work’ the way I had described it. But the node-oracledb project is very active and shortly after that, they added a feature which allows you to bind out to single value arrays. If you have tried my example code since then you would have noticed that the problem I described actually does work if you follow the comment from Chris Jones. The point of the post is to demonstrate ways to work around problems that may come up when binding to PL/SQL programs. It could be bind issues like below, or maybe you have a very complex query in your code and you want to use PL/SQL to handle the complex part but still use it as a query. I’ve updated this post to use a different example that will throw the same error. If/when my new example becomes obsolete due to new features in node-oracledb, just pretend the problem is real and try the solutions. When I’m learning something new, I prefer learning from code examples over reading documentation. I pick up little extra nuggets of knowledge this way since I tend to break things in the examples, which I then have to sort out and fix. However, I will only bang my head against the wall so many times before I read the docs. At last count, that was 57 times. One of the application examples demonstrates how to use a PL/SQL stored procedure to perform some different searches. The procedure uses OUT parameters to pass the data back. So I read the doc, fired up my trusty old search engine and searched, and then did what I should have done right from the start: lean on another member of my Oracle Developer Advocates team: Dan McGhan. Who immediately told me “The driver only support scalar types right now.” Update: The driver also supports arrays of a single string or number. When you learn by experimenting on code rather than reading the docs, sometimes you miss out on the ‘real words.’ I assumed ‘scalar types’ means a variable that holds a single value opposed to an array. Just to be sure, I found a decent explanation on Stack Overflow. Ha! The game is only over when you quit. It was time to explore some options. Return the results using JSON. I considered running the query, building a JSON object from the results and returning them as a string in a clob. But this doesn’t fit with the way the other application functions work. The database calls return unformatted results which are returned to the API functions and then those functions convert the results to JSON (or other formats if required) and sent back in the response. This could also be a viable solution and here’s a good example of how to use a ref cursor. One goal of this demonstration application is that all functionality will be reproduced in multiple languages; Python, Ruby, PHP and others. I am trying to keep the functions as simple as possible. Other languages may not be able to work with a ref cursor. I decided to use a pipelined table function. Table functions are very cool. In combination with the TABLE operator, I can return a collection to the FROM clause of a SELECT, and then have it treated as if it were a table, full of rows and columns. I can apply all the usual SQL SELECT operations on this dataset. Plus, the results are returned unformatted, so a developer should be able to use just about any language to run a simple query built around this feature. This works great but what if you can’t change the PL/SQL procedure to a function because it’s used elsewhere? Of course, there are other ways to work around the original issue and I’m sure there are better ones than what I’ve chosen. If you have a better solution, please share it. Speaking of sharing. The node-oracledb project is on GitHub under the Apache License, Version 2.0. If you are able to add support for compound types such as arrays, please submit a pull request.